This technology allows it to ”see” through wood, cement, brick, glass, etc. When an intruder enters the guarded area, it automatically begins barking like an angry dog. From outside, it sounds like you have a very unfriendly dog inside. 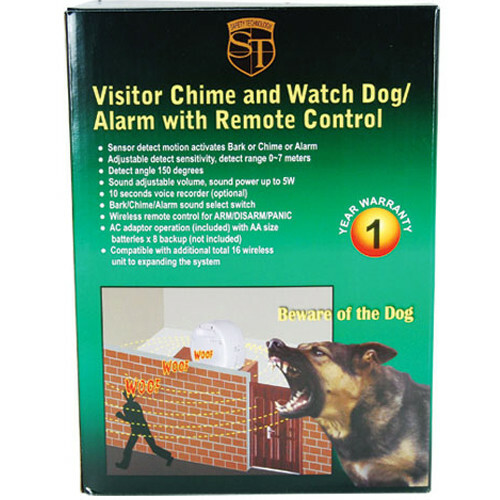 It also can announce visitors with a chime or alarm. volume is also adjustable. Stands 9 inches tall. Powered by AC power supply. Also takes 8 AA back-up batteries (not included) in case of power loss. Unit needs to face in the direction you want to detect motion. Detection is limited from the sides and rear. Remember, The included remote control lets you Arm and Disarm the system, as well as set off a Panic alarm. You can also connect up to 16 additional sensors to monitor larger areas; HA-MOTION or HA-SENSOR.